Commodity prices and growth: A changing relationship? In a recent paper, we seek to quantitatively assess the drivers of emerging economy business cycles using a unified model that both nests the various sources of shocks advanced in the literature, and also features a role for commodity price fluctuations (Drechsel and Tenreyro 2017). The quantitative analysis in our study focuses on Argentina, a quintessential example of a commodity exporting emerging economy. To motivate the model, we begin by showing empirically that the Argentine data reveal large positive effects of world commodity price shocks on output, consumption and investment, as well as negative effects on the trade balance. We identify these shocks using a structural vector autoregression (SVAR) model with a standard Cholesky decomposition, relying on the assumption that world commodity prices are not contemporaneously affected by Argentina’s economic activity (see Figure 1). Notes: The structural shock is identified using Cholesky ordering. 80% confidence bands are plotted. GDP, consumption and investment are real, in per-capita terms and in log-levels. The trade balance is defined as exports net of imports divided by GDP. Furthermore, the data display a strong negative association between interest rate spreads in Argentina and world commodity prices. We estimate this relation with a set of regressions of measures of Argentine real rate spreads (Argentine real interest rates net of the UK real interest rate) on an international commodity price index and various controls. The lower bound of our estimates, which are robust across a number of specifications, suggests that a 10% deviation of commodity prices from their long-run mean can move Argentina’s real interest spread by almost 2 percentage points. Motivated by these empirical findings, we propose a business cycle model that contains two elements absent in previous models. First, the model allows for a second sector to capture the separate role of commodities in the economy. Specifically, the analysis focuses on the case of a net commodity exporting country facing exogenous international price changes. Second, the model embeds a negative relation between the interest rate premium and commodity prices, which we show is consistent with the empirical evidence. The two effects stemming from commodity prices – that is, the competitiveness effect and the borrowing cost effect – jointly produce impulse response functions to a commodity price shock that mimic the empirical responses not only qualitatively but also quantitatively. They generate strongly positive effects on GDP, consumption and investment, and a negative effect on the total trade balance. They also give rise to excess volatility of consumption over output and a large volatility of investment. The first effect alone (akin to a productivity increase) cannot generate a countercyclical trade balance. The second effect alone (which is isomorphic to a simple negative interest rate shock) does not give a contemporaneous response in output, while consumption and investment do increase on impact. We estimate the model using data on output, consumption, investment and the trade balance of Argentina in order to gauge the quantitative importance of commodity price shocks, relative to other shocks, in driving the business cycle. Our results, shown in Table 1, suggest a sizable contribution of commodity price shocks to Argentine business cycle fluctuations. Notes: Posterior forecast error variance decomposition (at infinite horizon) of the observables used for estimation with Bayesian methods. Stationary technology (or TFP) is the sum of the contribution of technology shocks in both sectors of the economy. The posterior forecast error variance decomposition based on data from 1900 to 2015 attributes 22% of the observed variation in output growth to commodity price shocks. Furthermore, 24% of consumption growth and 34% of investment growth can be explained by commodity price shocks according to our estimation. Reassuringly, the model-implied process for the commodity price shares important features with empirically observed world commodity prices. Since it resembles the data well after 1950, we repeat the estimation on the post-1950 subsample and find that the contribution of commodity shocks to output, consumption and investment growth rises to around 38%, 42%, and 61%, respectively. Our assessment of the remaining variation in macroeconomic aggregates sheds additional light on the debate around candidate drivers of emerging economy business cycles previously proposed in the literature. We find that, in general, stationary TFP shocks remain the most important source of fluctuations, explaining around half of the variation in output growth, and are quantitatively more important than non-stationary TFP shocks. The contribution of nonstationary shocks remains non-negligible, as these shocks are able to explain 21% of the variation in output growth in the two samples used in the estimation. 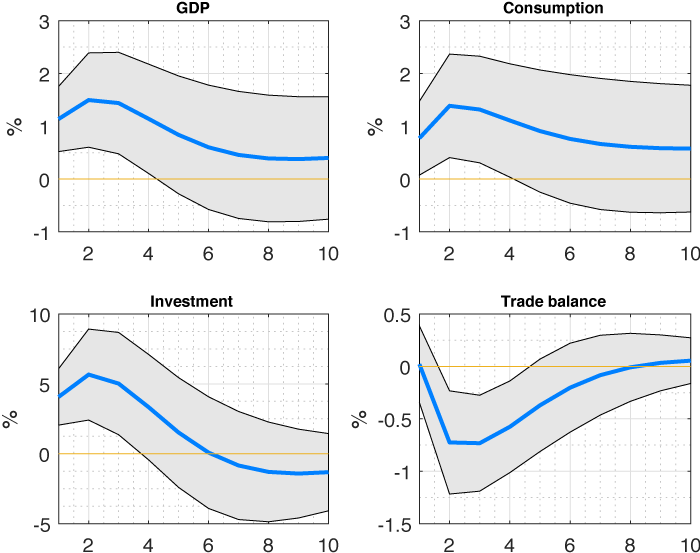 We also find a significant role for preference shocks and interest rate shocks, in particular for explaining important shares of the variation in consumption, investment and the trade balance. Taken together, our findings suggest that commodity prices should feature prominently in the analysis of business cycles in emerging economies. Although we do not address normative issues, the results offer hope. Insofar as part of the cycle can be accounted for observable variables (world commodity prices) that cannot be manipulated for political goals, macroeconomic policies that depend on commodity prices can be implemented to help mitigate the cycle. Given the nature of the driver, sovereign wealth funds may offer a promising avenue for tackling volatility in commodity producing countries like Argentina. Aguiar, M and g Gopinath (2007), “Emerging Market Business Cycles: The Cycle Is the Trend”, Journal of Political Economy, 115:69–102. Drechsel, T and S Tenreyro (2017), “Commodity Booms and Busts in Emerging Economies”, Working Paper. Fernandez, A, S Schmitt-Grohe and M Uribe (2017), “World shocks, world prices, and business cycles an empirical investigation”, Journal of International Economics. Garcia-Cicco, J, R Pancrazi and M Uribe (2010), “Real business cycles in emerging countries?”, American Economic Review 100(5):2510–31. Schmitt-Grohe, S and M Uribe (2017), “How important are terms of trade shocks?”, International Economic Review (forthcoming).